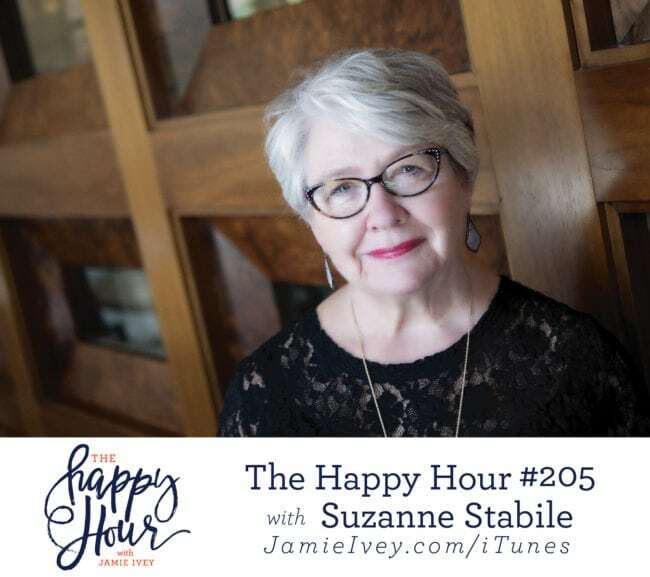 My guest for The Happy Hour # 205 is Suzanne Stabile. Suzanne is an internationally recognized Enneagram Master, author, and speaker. As an Enneagram Master, she has conducted over 500 Enneagram workshops over the last 25 years to many audiences including churches, colleges, and hospitals. Suzanne is mom to four, and grandmother to seven, and when she's not on the road teaching, she resides in Dallas with her husband Rev. Joseph Stabile. Friends, I am so excited and honored to share today's show with you. Suzanne is so gracious and full of wisdom - I know you're going to love our conversation as much as I did! Suzanne starts off the show sharing some history about the Enneagram including how it can be most helpful and ways to utilize it most effectively. She shares her thoughts on the prevalence of the Enneagram lately and reminds us that the Enneagram is a tool to help understand the motivations of our own and others' behaviors and "offers us nine ways of seeing the world." Suzanne and I then talk about the Enneagram with children, parenting, and adoption. She is often asked about using the Enneagram in parenting. Suzanne tells us that a person's number can be well determined by just 5 years old, but she urges caution and believes it should not be taught until 16. But don't worry if you're wondering, but what can I do now? She gives us wise advice and encouragement for a place to start: "If you want to use the Enneagram for parenting, then be the healthiest person in your number." Suzanne also shares that she was adopted, and how that has influenced her work. Suzanne speaks truth when we talk about adoption, trauma, and how wounds can heal, but we must recognize they are always part of the person. You guys, there are so many great things in this show that I want to include it all! So go back and listen again or better yet, learn more by checking out the links below. But one last thing - it came up a few times during the show - Suzanne stresses the importance of doing the work to figure out your Enneagram number, and don't rely on simply taking a test. As Suzanne states, "There’s no reason to take a shortcut with something that is so valuable." The Happy Hour Summer Book Club's August Book: Just Mercy by Bryan Stevenson AND we're extending the club - join us for September! Prep Dish - $4 for One Month!